Last year I blogged about Brackets with Benefits (and April Madness, too! 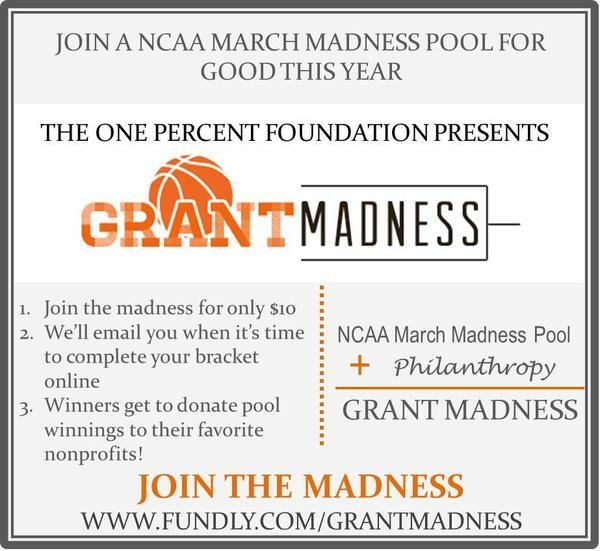 ), and this year, another great way to get psyched for the NCAA tournament is to enter the One Percent Foundation‘s pool called Grant MADNESS. In this third annual competition for good, you donate $10 (the first 500 entries are matched by MerchSource… double impact!) to play. The winners get to contribute the donated money to their favorite nonprofits. Sign up TODAY; brackets need to be filled out by Thursday morning at 11:30am EST.